For the best in custom swag, look to the Wilson brand. Known around the world, Wilson promotional products are sure to impress your employees, clients and potential clients at company events, business expos and other industry outings. Promotion Pros offers the best in personalized Wilson promotional products, with everything from coolers and collapsible Koozies to golf balls. Show off your brand with customized Wilson swag to give away at corporate events, industry trade shows and to say thanks to current customers. Let us help you with your custom bulk promotional items. Our Wilson Eco Core Golf Ball features a green friendly and environment friendly design and allows adding brand logo to Promote your Brand. 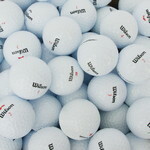 Our Wilson Plain White Golf Ball, Bulk Packed features resilient, cut proof ionomer construction and makes interesting Company Logo Products with your brand logo. The Wilson Staff Duo Golf Ball Set is perfect for players seeking soft ball without compromising distance, Customizable with brand logo. The Wilson Staff Duo Urethane Golf Ball Set features low compression core, urethane cover and inner resin mantle, Customizable with your brand logo. Our Wilson Staff FG Tour Golf Ball Set features soft, high spinning urethane construction and creates excellent choice for Corporate Holiday Gifts with brand logo. Our Wilson Ultra 500 Golf Ball Set offers optimum spin for maximum control and allows inserting brand logo to Promote your Brand. Our Pillow Pack features golf balls and tees and creates a nice pick for Company Logo Products with custom imprint of brand details.